Each team has four players, but most have a couple extras in case someone can’t make it. Two members fro each team play on either side of the court. Games can can be played with only three players on a team but that team must alternated players with the odd man sitting out every 3rd frame. A fourth team member can join in at any time. Teams with only two players should not play and is considered a forefit unless the opposing teams agrees to play under the circumstance. At the start of a match, team captains flip a coin. Winner gets to throw the pallino, or choose ball color – either pink or blue. When throwing, you should stay behind the (invisible) foul line. Our foul line is the end of the angled timbers on the court’s edge. If the pallino doesn’t clear the center of the court, or it hits the back board, then the other team gets to toss the pallino. 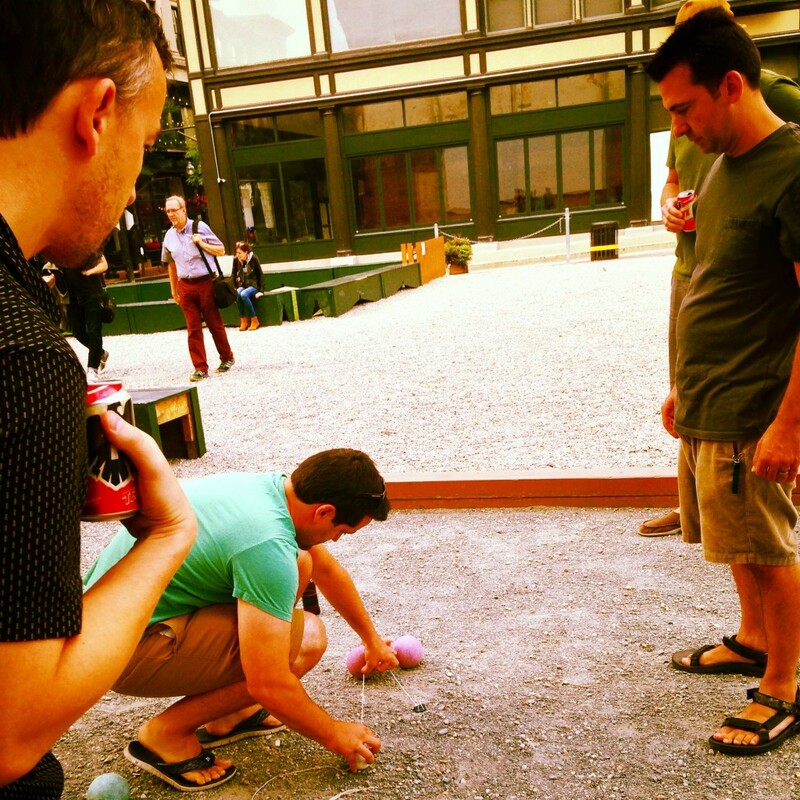 Whoever tosses the pallino also throws the first bocce ball. Then, the opposing team continues to throw until they are closer to the pallino or have thrown all four balls. Whenever a team gets a ball closer, it steps aside and lets the other team throw. This continues until both teams have thrown all four balls. The team who scored last throws the pallino in the next frame. If your ball hits the back board, it’s out of play and must be removed from the court. If your ball hits another ball first, then the backboard, it stays in play. All side boards are fair game. If you can’t tell whose ball is closer to the pallino, measure them. There’s usually string in the bocce ball bag. If you have a fancy mini-measuring tape, all the better. Whoever’s ball is furthest away gets the next toss. Only one team scores in a frame. One point is given for each ball closer to the pallino than the closest ball of the opposing team. If both teams’ balls are tied for closest, no points are awarded to either team. Each game is played to 9 points. Best of three games wins the match. If you can’t make a game, get in contact with the opposing team’s captain no later than an hour before the game. Then, plan a time to reschedule your game towards the end of the season. If a makeup game can’t be set within the regular season, the team that originally couldn’t make the game will suffer a forfeit. A forfeit counts as a match loss. If a team misses a game without contacting the opposing team, they will suffer a forfeit. If your game looks like it might be rained out, get in contact with the opposing team’s captain no later than an hour before the game. Then, plan a time to reschedule your game towards the end of the season. Team captains are responsible for emailing their team’s win. No-shows and rainouts should also be reported. Please report your wins here.